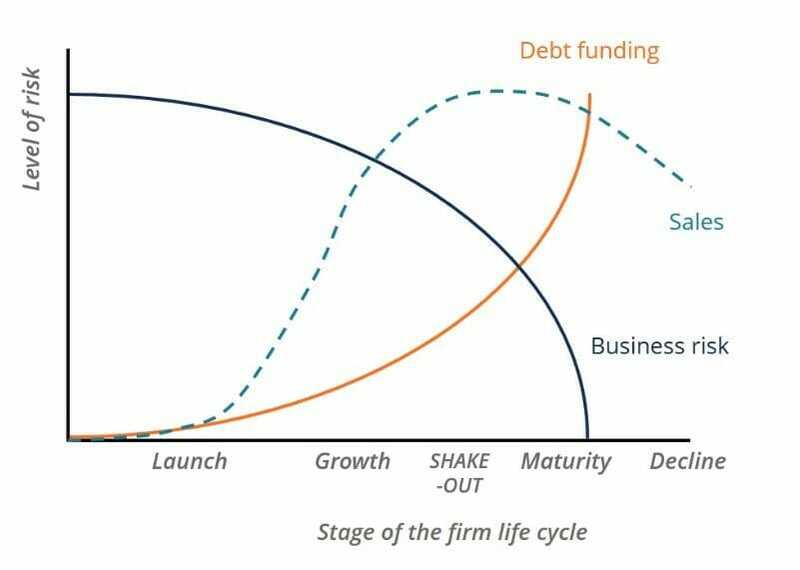 The business life cycle is the progression of a business and its phases over time, and is most commonly divided into five stages: launch, growth, shake-out, maturity, and decline. The cycle is shown on a graph with the horizontal axis as time, and the vertical axis as dollars or various financial metrics. In this article, we will use three financial metrics to describe the status of each business life cycle phase, including salesSales RevenueSales revenue is the starting point of the income statement. Sales or revenue is the money earned from the company providing its goods or services, income, profitNet IncomeNet Income is a key line item, not only in the income statement, but in all three core financial statements. While it is arrived at through the income statement, the net profit is also used in both the balance sheet and the cash flow statement., and cash flowValuationFree valuation guides to learn the most important concepts at your own pace. These articles will teach you business valuation best practices and how to value a company using comparable company analysis, discounted cash flow (DCF) modeling, and precedent transactions, as used in investment banking, equity research,. Image: CFI’s FREE Corporate Finance Class. Each company begins its operations starting operations as a business and usually by launching new products or servicesHow VC’s Look at Startups and FoundersA guide to how VC's look at startups and founders. The odds of being funded, the odds of commercial success, traits they look for, good vs bad pitches, and how to increase your chances of getting startup capital from a venture capital firm.. During the launch phase, sales are low, but slowly (and hopefully steadily) increasing. Businesses focus on marketing to their target consumer segments by advertising their comparative advantages and value propositions. However, as revenue is low and initial startup costs are high, businesses are prone to incur losses in this phase. In fact, throughout the entire business life cycle, the profit cycle lags behind the sales cycle and creates a time delay between sales growth and profit growth. This lag is important as it relates to the funding life cycle, which is explained in the latter part of this article. Finally, the cash flow during the launch phase is also negative but dips even lower than the profit. This is due to the capitalization of initial startup costs that may not be reflected in the business’ profit but that are certainly reflected in its cash flow. During the shake-out phase, sales continue to increase, but at a slower rate, usually due to either approaching market saturation or the entry of new competitors in the marketThreat of New EntrantsThe Threat of New Entrants refers to the threat that new competitors pose to current players within an industry. It is one of the forces that shape the competitive landscape of an industry and helps determine its attractiveness. Other forces are competitive rivalry, bargaining power of buyers, threat of substitutes,. Sales peak during the shake-out phase. Although sales continue to increase, profit starts to decrease in the shake-out phase. This growth in sales and decline in profit represents a significant increase in costs. Lastly, cash flow increases and exceeds profit. When the market matures, sales begin to slowly decrease. Profit margins get thinner, while cash flow stays relatively stagnant. As firms approach maturity, major capital spending is largely behind the business, and therefore cash generation is higher than the profit on the income statementIncome StatementThe Income Statement (or Statement of Profit and Loss) shows performance from operations of a business. The financial statement begins with revenues and. 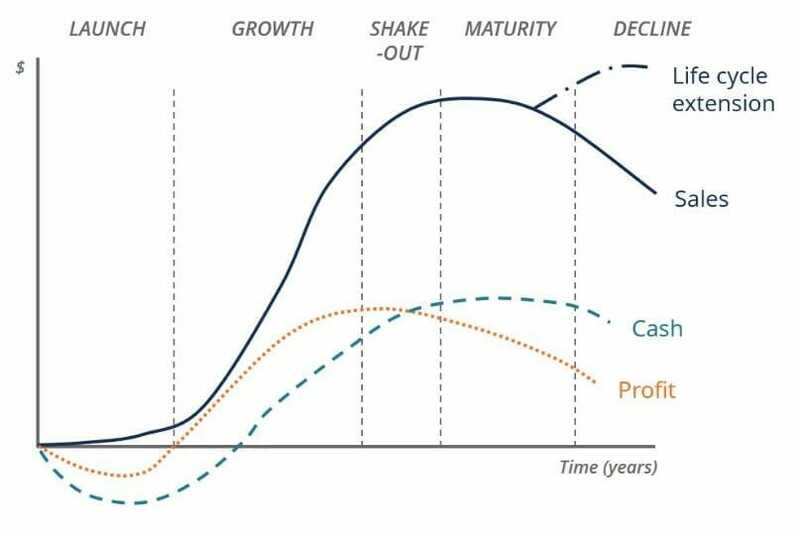 In the final stage of the business life cycle, sales, profit, and cash flow all decline. During this phase, companies accept their failure to extend their business life cycle by adapting to the changing business environment. Firms lose their competitive advantageCompetitive AdvantageA competitive advantage is an attribute that allows a company to outperform its competitors. Competitive advantages allow a company to achieve and finally exit the market. Careers in Corporate DevelopmentCorporate Development Career PathCorporate Development jobs include executing mergers, acquisitions, divestitures & capital raising in-house for a corporation. Corporate development ("corp dev") is responsible for executing mergers, acquisitions, divestitures and capital raising in-house for a corporation. Explore the career path.